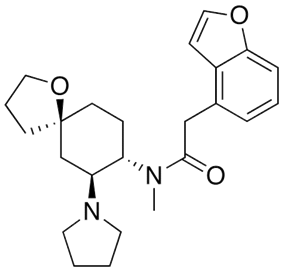 When enadoline was first reported in 1990, it was "the most potent κ-selective analgesic ever reported ... 25 times more potent than morphine and 17 times more potent than U-62066". ^ Walsh SL, Strain EC, Abreu ME, Bigelow GE (2001). "Enadoline, a selective kappa opioid agonist: comparison with butorphanol and hydromorphone in humans". Psychopharmacology (Berl.) 157 (2): 151–62. ^ Barber A, Gottschlich R (1997). "Novel developments with selective, non-peptidic kappa-opioid receptor agonists". Expert Opin Investig Drugs 6 (10): 1351–68. ^ Halfpenny, Paul R. (1990). "Highly selective .kappa.-opioid analgesics. 3. Synthesis and structure-activity relationships of novel N-[2-(1-pyrrolidinyl)-4- or -5-substituted cyclohexyl]arylacetamide derivatives". Journal of Medicinal Chemistry 33 (1): 286–291.